﻿ How Color Can Stir Emotion in Your Nonprofit Emails » Red Mango Marketing! Color shapes the way we look at the world, and whether you know it or not, color influences the actions you take and the products you buy on a daily basis. Your nonprofit organization can harness the power of basic color theory to drive your volunteers and donors to action. Learn how color is speaking to your emotions to design emails that make your volunteers and donors care about your cause. You can’t hire a designer every time you want to create a new email template or choose a call-to-action button color. Knowing how different colors cause different thoughts or feelings about a brand, even at a basic level, can help you make smarter choices for your nonprofit organization. Red – Great for eliciting excitement in your email, but can overwhelm if overused. Yellow – Looks clever, youthful, and grabs attention, but can also tire a reader’s eyes. Green – Like a plant, this can convey something new, fresh or something growing and mature. Blue – Deep and serene like the ocean, but also conveys trust and stability. Purple – Luxurious as royalty, while also both inspiring and clever. Black – Timeless, classic and modern at the same time, like a black tux or a little black dress. White – Can be used as a smart accent or as a primary color like Apple, as it always feels modern and clean. Brown – Earthy, rugged and often masculine, like the bark of a tree. The goal of using color is to make your audience feel something. Which emotion you want them to feel depends on your nonprofit’s goal and the goal of your email, but no matter what emotion they feel, you want it to drive them to act. If your nonprofit is working towards a somber or touchy issue, then stay away from warm colors, like reds and yellows. Instead, try cool colors like blue to express sadness and serenity, or try a blend, like purple, as it’s both calming and bright enough to inspire people to feel energized. No matter which color you use, make sure the email conveys what you want your audience to do next. Color is a powerful tool, but it’s effects are also strange and subjective. Depending on cultural differences and personal experiences, colors can convey different emotions to different people, or even look different. Keeping your target audience sharply focused in your mind will help to choose the right color for the right people and get them to act. If your audience is young and energized about your cause, warm colors can help buoy their spirits. If your audience is older and more experienced, cool colors may be a better match. 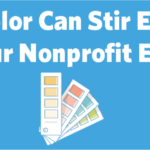 Using the right colors in your email can help to shape the way your volunteers and donors see your nonprofit organization. Color can draw better attention to your calls to action and inspire them to feel a strong emotion about your cause. Start using basic color theory as a tool to drive your volunteers and donors to action and your email marketing will become more powerful with every send. The post How Color Can Stir Emotion in Your Nonprofit Emails appeared first on Constant Contact Blogs. This entry was posted on Monday, July 2nd, 2018 at 8:00 am	and is filed under email design, Email Marketing, News & Updates, Nonprofit. You can follow any responses to this entry through the RSS 2.0 feed. Both comments and pings are currently closed.